George Callendine and William Cox (right) take turns stirring while Ella Harvey pours water into a mixture at Delaware City Schools’ summer enrichment course “Crazy Chemistry.” The students were tasked with creating “Oobleck,” a mixture that has properties of a solid and a liquid. Students had to do a variety of activities with the mixture and report what state of matter it was in during the experiments. 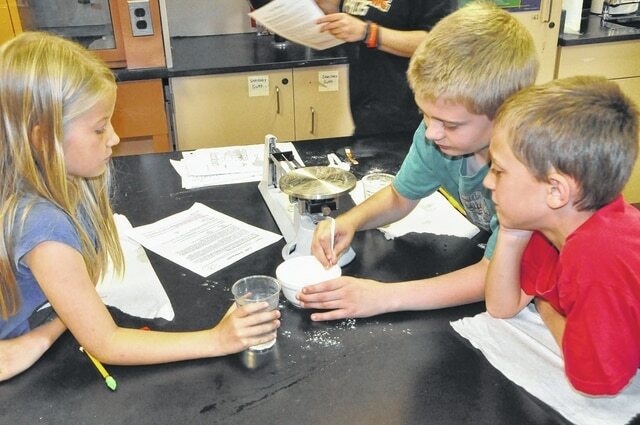 “Crazy Chemistry” is just one of Delaware City Schools’ summer programs.